Thanks so much for joining me for Day 2 of Follower Appreciation! If you’re just now popping in, be sure to check out yesterday’s post to be sure you don’t miss out on anything! We’ll start with yesterday’s winners! 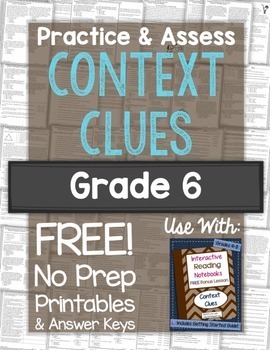 These worksheets are designed to complement my free interactive notebook lesson on Context Clues, so if you haven’t downloaded that yet, be sure to grab it here. Tomorrow’s freebie is a brand new poster set, so make sure you don’t miss it! Today’s daily book quiz is not a personal favorite of mine, but my students just love it. It really is a great historical fiction novel set during the Holocaust that is mild enough for 4th-6th graders. I did appreciate it more after I learned about the history behind the events in the story. While on a field trip with my 8th graders to the Holocaust museum in Houston, our tour guide (an elderly Holocaust survivor himself) showed us one of the fishing boats with the false bottom that was used to save the Jews of Denmark. King Christian, the beloved King of Denmark that is mentioned several times in the book, was the only leader in Europe who sheltered and managed to save most of the Jews in his country by helping them escape by boat. Anyway.. I didn’t mean to write a novel about that myself, but you can grab the book quiz for Number the Stars here! ***Sorry, but this giveaway has ended. *** It’s only available for the next 24 hours, so get it while you can! These book quiz sets contain questions that test literal comprehension only, no critical thinking. 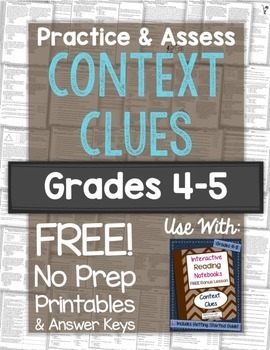 The idea is to hold the students accountable for reading the assigned material. The critical thinking comes into play during the literature circles group meetings! Next up is one of my very favorite giveaways EVER – The Watsons Teaching Pack! 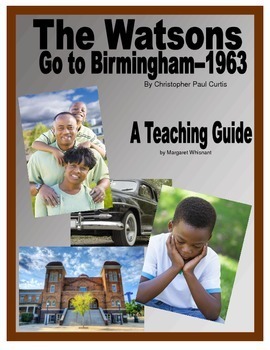 Enter to win a class set – 25 copies – of The Watsons Go to Birmingham, 1963. I’m also including 5 copies of this great nonfiction book for researching civil rights to go along with the novel. And, I MUST include a copy of Margaret Whisnant’s Novel Study Teaching Guide for this book. It’s so comprehensive that you won’t need anything else! And since we can always use a little something extra to make life easier this time of year, I’m giving away another $25 TpT gift card! Enter to win below, and be sure to come back tomorrow to see if you’re a winner! I love doing Spring Poetry lessons! Thank you for everything you do for us as teachers. I just started using interactive reading notebooks this year with my class. I think I bought every one of your reading notebook products this summer and I love using them. You make it so easy with the detailed instructions for each lesson!! My students love them too, and they are retaining so much more information! Thank you! I enjoy teaching about life cycles! I love teaching poetry and figurative language. I'm trying something new this year by writing poetry on paint sample cards after we learn the "nuts and bolts". I like teaching about new plants. I love teaching the American Revolution in the spring-it's one of my favorite topics! The kids love it as well. Since I live in Mass., I love teaching about Patriots' Day. Also, I love poetry! I enjoy teaching about pioneers in the spring. I run a simulation where students choose their supplies and have different fates happen to them, and it's a lot of fun. I love doing research with my 6th graders. They create a presentation about an animal to practice speaking and then write a book using the mentor text Diary of a Worm by Doreen Cronin. I love the creative ways they integrate the research into a humorous fiction story. I enjoy teaching poetry in the spring. We study "The Walrus and the Carpenter" and do poetry comics. I'll decorate the classroom with oversized paper flowers and the students' poetry comics for open house. So excited on your milestone, Erin! I love to teach poetry. My favorite is reading some silly poems to my students. It gets them excited about writing poems! Number the Stars is an amazing book! At the end, the author goes through what is real and what is fiction. The story of the handkerchief is unique – using squirrels blood and cocaine to fool the dogs looking for the hidden Jews! Spring is when I usually like to focus on poetry and figurative language. I'm a Title 1 intervention teacher. I love spring because my 3rd grade readers are ready to read a novel. We are in the middle of The Stories Julian Tells, one of my all-time favorites for this age group! I enjoy teaching poetry in the spring. Fresh off of our last Unit and the pressures of testing we stole 3 sweet weeks of book clubs and making our own book trailers! I bought your spring unit last year and Whisnant's Watsons plans – the kids really loved them all! I managed to find The Watson's on DVD too! My favorite thing to teach in the spring is Imagery Poetry! Poetry is such a wonderful unit to teach! Plants and soils in Science! I love, love, love teaching poetry in the spring! A close second is the Oregon Trail. Drama. Tomorrow I'm going to start my students with a play called Historical Hysteria. It is perfect for me since I teach fourth grade and fourth grade deals with US History, so I LOVE that I'm including SS in LA. We have done a lot of Deb Hanson's partner plays during my MTSS time, so I know my students are going to really appreciate the play, and then I will have my students perform it in for their parents and some of the other kids at school at the very end of the school year. Thanks for the amazing freebies and giveaways! I'm not a teacher, but I love doing a beach theme with my speech pathology students! Thanks for the giveaways this week and congratulations on your mega-milestone! I really annoy teaching poetry in the spring. I love teaching about life cycles. Love working on research projects with the kids. By this time we've had so much testing the kiddos need a fun project to work on to finish the year. I love teaching forces and motion in the spring. Love teaching poetry in the spring with all of the great figurative language. Thank you! I love teaching poetry elements and figurative language in the spring. I love to teach poetry, the Titanic, and the Holocaust in the spring! I have enjoyed teaching All About Books in writing. My kindergarten students have just flourished! I love teaching poetry. We use your poetry interactive notebook, and then we write our own poems. We create a poetry anthology using a Studentreasures class book! SO MUCH FUN! I L-O-V-E teaching about folktales and legends! Love doing drama/plays in the spring. The kids get a chance to move around and be silly! I'm thinking after looking at all these other posts I need to up my game!! I usually try to fit in more hands- on/creative learning in the spring. In Spring, I love using Eve Bunting's books as mentor texts for writing. Someday a Tree, Butterfly House, and Sunflower House are great spring books that work well for ideas and word choice. I love our life cycles unit in science! figurative language and literature circles!! I love to do our big poetry unit in the spring. My favorite is poetry and then I move right into teaching The Giver. We just did a unit on physical and chemical changes. My students loved it and I did too! We wrap up the year with literature circles for Because of Winn Dixie and a party. Thank you for the giveaway! Looks like I'm not alone in enjoying poetry. My favorite thing to teach in Spring is weather. Our Science pacing guide always has us teaching about weather and natural disasters during the spring, when we get some seriously wild weather here in South MS! My students have actually enjoyed looking at the weather map to see where cold fronts and high pressure areas are located! My favorite topic to teach in the spring is poetry. We love your INB! I love teaching about animal life cycles. This is my first year teaching grade 6 and we're going to be tackling child labor starting next week. Most of my students are from privileged backgrounds and live sheltered lives. By quarter 4, they are ready to start learning about the real issues that plague Egypt (where we live). We do a novel study (Iqbal) and research child labor. P.S. I absolutely love your resources! I bought 3 of your interactive notebooks and have started using them with my ELS students. I just downloaded the sample of the Greek and Latin Roots book. I can't wait to try it with my class next week. I hope I win! It looks awesome! Thanks so much for all of these awesome freebies!!! Congratulations on such a great milestone!! !